Is libeling a climatologist defensible free speech? Kurt Eichenwald, writing at Newsweek, updates the legal case of a climatologist fighting libel. Michael Mann is the director of the Earth System Science Center at Pennsylvania State University. In 1996 and 1997, as a postdoctorate, Dr. Mann was working with other climatologists to determine whether modern global surface temperature anomalies were the most profound in the recent past. Mann et al. 1998 made the claim that late 20th century global surface temperatures were the warmest since 1400. Global surface temperatures resembled a "hockey stick", with a quick rise in the 20th century. While subsequent authors have greatly expanded the temporal coverage of Holocene global surface temperature reconstructions, confirming and expanding upon Mann et al. 's findings, Dr. Mann is going to be linked to "the" hockey stick graph for the rest of his life. Unsurprisingly, not everyone agreed with Dr. Mann's work. 15 years later, Dr. Mann and his work have both been given enormous amounts of criticism from contrarian scientists, politicians, policy groups, and journalists. Following the CRUhack debacle of late 2009, which featured up private emails of climatologists talking amongst themselves, including Dr. Mann talking with his colleagues and his methods being discussed, his employer, Pennsylvania State University, one of his primary funders, the National Science Foundation, and the National Research Council of the National Academy of Sciences all investigated Dr. Mann's work. PSU, in two independent inquiries, determined "that Dr. Michael E. Mann did not engage in, nor did he participate in, directly or indirectly, any actions that seriously deviated from accepted practices within the academic community." NSF found no evidence of research misconduct. The NRC of the NAS found some faults with his methodology but agreed that his results were valid. Dr. Mann has been thoroughly investigated by four different inquiries by three different organizations and none of them found any wrong-doing on his behalf. "Mann could be said to be the Jerry Sandusky of climate science, except that instead of molesting children, he has molested and tortured data." Simberg dismissively mentioned the investigation by the NAS, although he inaccurately claimed that the NAS had obtained findings from PSU, which is the opposite of what actually occurred. Mark Steyn, writing for National Review Online, added in his own thoughts on the Simberg article, labeling Dr. Mann's work as "fraudulent" and argued that Penn State "declined to find one of its star names guilty of any wrongdoing." So from Mr. Simberg and Mr. Steyn there were accusations of data tampering, wrongful science, fraudulent science, and a disconcerting analogy involving child molestation. Dr. Mann told CEI and National Review that he would take legal action if they didn't edit down their tone and apologize. CEI edited down their tone, National Review's editor, Rich Lowry, dismissed Dr. Mann's warning and passively aggressively asked to get sued. Dr. Mann filed a lawsuit, and so far it is being determined whether or not the suit will ever see court. CEI/Mr. Simberg's lawyer claims that everything said was "fully protected speech under the First Amendment and will likely be treated as such by the Court of Appeals." Mr. Steyn "stand[s] by everything [he] wrote, and [he's] happy to defend it in court and before a jury - if it comes to that". Mr. Steyn used to be represented by National Review's law staff, but wants to defend his statements in court rather than try to settle this case out of court. To give him one more quote: "He's suing me for calling his hockey stick 'fraudulent', which it is." Does Dr. Mann have a case? It certainly seems as if the allegation is untrue; no one so far has determined that Dr. Mann is a scientific fraud. And it certainly seems as if the allegation was intentionally made to defame: CEI and the National Review are both interested in causing damage to Dr. Mann's credibility and his ability to gain employment. Dr. Mann is not yet in his 50s and if he truly has committed scientific fraud, his likelihood of getting more employment in his field is low to say the least. What makes no sense about this libel? Mann's work on Mann et al. 1998 was 14 years old when Mr. Simberg and Mr. Steyn libeled him. 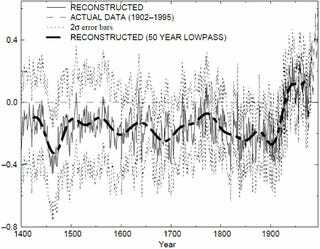 Since 1998, lots of things have happened in climatology, and "Mann's" hockey stick has been eclipsed by a multitude of studies that have corroborated and expanded the conclusions of that paper . Heck, last year, Marcott et al. published a study concluding that modern global surface temperatures are possibly the warmest in 11,500 years. Attacking one author of one scientific paper from over a decade ago is extremely unproductive, but I guess in light of the overwhelming evidence that human civilization is causing global warming, one has to pick and choose one's battles. CEI and National Review both appear to believe that libeling a scientist is a better battle than accepting a scientific discovery and helping prepare human civilization for an interesting century of climate change.